I visited K’nyay specifically to try their very recommended vegan ice creams and left a fan of everything else. Not wholly vegetarian, they have separate meat and vegan menus, with a very good (read: trustworthy) understanding of veganism. There’s plenty of selection, plus a couple of extra mains on the wall menu. Its contemporary decoration and shaded location make it a great spot to while away an hour or two to escape that hot afternoon sun. Plus the staff are absolutely adorable, very helpful, and willing to answer any questions you might have. K’nyay is a Phnom Penh must. 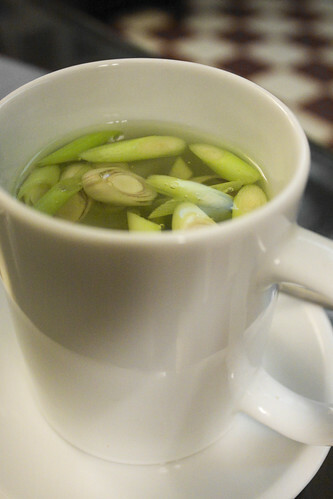 Literally (a word I generally avoid since people don’t seem to know what it means) chopped up lemongrass in a mug of hot water, this simple tea was wonderfully refreshing. 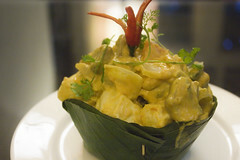 Huge chunks of soft tofu and vegetables in a creamy smooth, only moderately spicy coconut cream sauce, steamed in a banana leaf vessel. Adorned with fresh coriander and chili, this dinner was worth a trek through violent rain to consume. Sticky black rice is served alongside. Not too sweet, these custard like pumpkin puddings are gummy, chewy, and delicious. 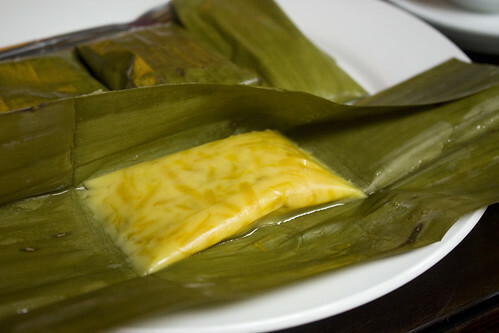 Pumpkin and coconut cream are steamed in banana leaf with sticky rice flour (or so I was told). The reason I came to K’nyay in the first place was because another vegan raved about the ice cream. The recommendation was spot on, and I thoroughly enjoyed both the coconut ginger and the cherry almond scoops. The former had a prominent ginger taste that somehow remained quite mellow, with a smooth texture. 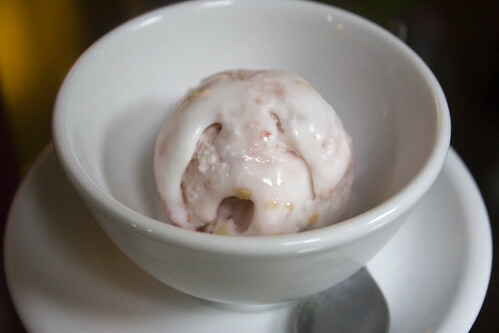 The latter ice cream, the almond and cherry, contained big chunks of cherry and toasted almond slivers. Absolute heaven. I wish I’d have had more time in Phnom Penh because I really would have liked to return to K’nyay for a second meal (I went twice for dessert)! Unfortunately one of the few days I was in PP was a public holiday, which took away from my only intention to be in the city in the first place: to eat. Next time I’ll plan a few days more in the capital so I can fit the rest of the menu in (which, by the way, you can check out online). Oh that all looks wonderful but I’m digging the Vegan Amok and ice-cream the most. Oh, I’m so glad you tried and enjoyed the ice cream! I love Kn’yay and can’t wait to make a trip back there if I’m ever in PP again! The ice cream was amazing! I keep craving their vegan amok, too.